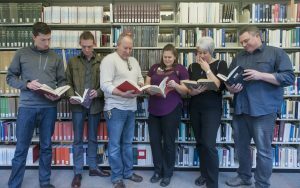 Spread the Word is both our team name and project objective…to Spread the Word about Little Libraries in Nanaimo! Back in 2014 the Social Planning Department at the City of Nanaimo, Rotary Nanaimo North and other community groups arranged for construction and installation of approximately 30 Little Libraries in Nanaimo. With the popularity of these neighbourhood gathering places increasing, we have seen the need to create new Little Libraries and repair existing Little Libraries. Thanks to the support of our community sponsors, Spread the Word will connect existing Little Librarians with the Career Technical Centre (CTC) students at John Barsby Secondary School to ensure that requested repairs are made. The CTC students will also construct and install new Little Libraries in a select number of neighbourhoods. Other project partners include: Nanaimo – Ladysmith Public Schools SD 68, Vancouver Island Regional Library, City of Nanaimo, Industrial Plastics and Paints, Windsor Plywood and Cloverdale Paints.